Property Management System for hotels - Innsoft, Inc.
Hotel Property Management System It’s intuitive, flexible, and customizable for properties with up to 350 rooms. Check-Inn hotel management software by Innsoft is a flexible, easy-to-use, Windows based property management system that is trusted by thousands of hotels and motels nationwide. Our in-house, U.S. based, support experts provide excellent customer service making training and operations quick and efficient. You deserve to get the most from every single room. Simple to use hotel software’s rate and yield management tools to maximize your profits. Protect yourself from fraud and credit card theft with our fully integrated hardware and property management system. Credit card numbers are safely stored in the cloud not on your computer! Manage all of your guests and reservations right from the main screen with our hotel management software . No need for complicated menus or procedures. Check-Inn hotel PMS is fully integrated with our Connect-Inn channel manager and hotel booking engine. Connect-Inn offers seamless integration with all of your OTA channels and commission-free bookings with our Booking Engine Button. From ID scanners to signature pads, Innsoft has you covered. Innsoft has all of the hardware to save your money and speed up operations. Innsoft is the leader in affordable hotel PMS system since 1991. Technology can help you only if you can afford to use it! Superior tracking of guest activity, such as reservation changes and cancellations with hotel PMS system. Downloadable monthly Check-Inn software updates for hotels with active Service Contracts. Individual password protected accounts for each Check-Inn PMS user. Trouble-free daily audit reporting to streamline operations. Easy-to-read daily, monthly, and shift reports with Check-Inn hotel software. Comprehensive accounts receivable billing system. 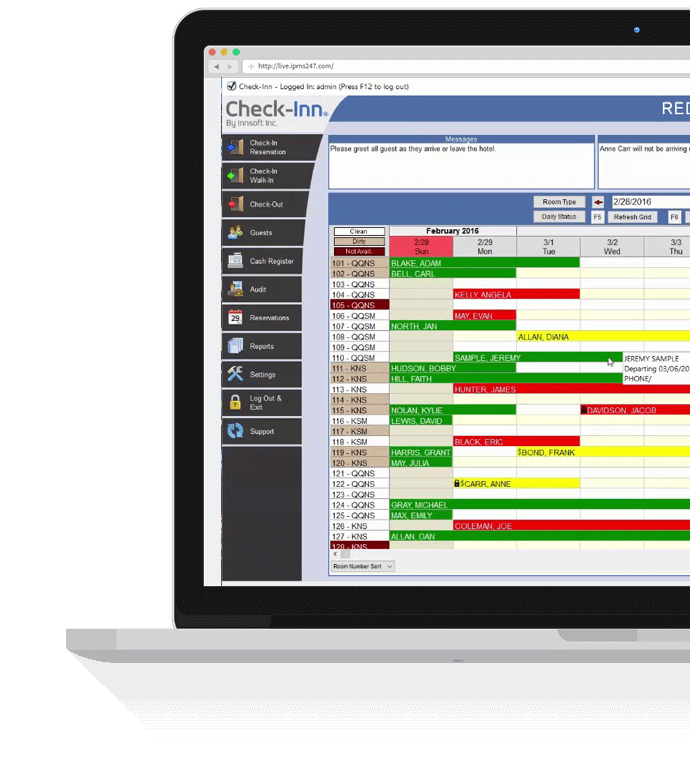 Customizable shift reports with Check-Inn hotel management system. Cloud reporting features. * View your financial reports, reservation reports, guest reports, and more with our secure online dashboard. *Purchase of any optional software, hardware, or services requires an active Service Contract for Check-Inn. The Service Contract must be maintained for any online reservation interfaces (GDS, Booking.com, Expedia, and Booking Button). Contact Innsoft for information about your software licenses and Service Contract status. We also invite you to view helpful Demo Videos: How to Check In Guests Using Check-Inn V6 and Creating a Reservation using Check-Inn V6.